During the first week of the February Photo Fest last year (2018) Craig M., myself and one of my collection of mannequins went for a photoshoot to an abandoned local railway station in the countryside. The images involving myself and the mannequin were in response to an ArtTwist prompt involving twins suggested by my pal Cousin Pons @books1799. I was still deep in the throes of my early Indigo phase, wearing that colour every day in mourning for Mum. On the Platform featured us both wearing that colour as we posed for Craig’s camera. 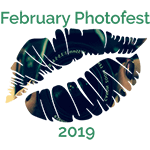 Recently Craig and I spent time going over photos from this and other early photo shoots and he took on the task of editing some photos for me for #FebruaryPhotoFest2019. I knew that he was not overly keen on my deep blue clothing but I did get a nice surprise when he produced this edit – changing our clothing to a more luscious violet – a colour I love and am happy to wear. This then is one of the previously unseen images from that day. This entry was posted in #FebruaryPhotoFest2019 and tagged #ArtTwist#2, #FebruaryPhotoFest2019, @books1799, Clothing, Craig M., Indigo, legs, mannequin, photography, station, twins. Bookmark the permalink. The violet in this is definitely luscious! Using an abandoned railway station for a photo shoot sounds great fun and a wonderful backdrop. Cool shot and wonderful back story! Unusual props? Check. Abandoned building? Check. Natural setting? Check! I love this stuff! Thanks. Have you seen A Leap of Faith’s post? Amazing images, setting, story. Oh yes thanks for the tip! I headed over there and they are beautiful. What a most marvellous picture of you, I love this! I love the contrast of the frilly “prim and proper” clothing with the rough background.